Happy Valentine's Day! It's Love Week here at the Vaughn Life Coaching Blog. 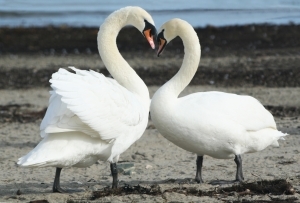 We'll be having lovey dovey/lovey swan-y themed posts all week! Thursday - Answer to one of your questions on love. Friday - Guest Blogger: Nathan Robbins, discussing the use of personality typing to improve relationships. This ten minute fix isn't about getting back together with your ex, but instead, getting back the excitement and butterflies you felt when you first started dating your spouse. Over the course of the years, the thrilling and spontaneous love two people feel when they are first getting to know each other evolves into a more comfortable and secure love. While this evolution is natural and good for us as we settle down, it's fun to remember the days when you didn't know that he only sneezes in pairs, or she only eats the tops of muffins. What was it that initially attracted you to your spouse? What do you love about your spouse that you didn't know when you were dating? How would you treat your spouse today if you were still trying to win them over? 2. Tell them the answers to the first two questions. 3. Show them the answer to third question. It's not healthy to expect love to always be a raging fire, but stoking the flames every once in a while and then returning to your comfortable and cozy glowing embers is perfectly healthy, and a nice way to live. Happy Valentine's Day again, and don't forget to check back every day this week!